The final two games of round two in the CaptiveOne U.S. Open Polo Championship® featured a pair of exciting 13-12 outcomes, with Aspen claiming the overtime victory over Santa Clara, while Daily Racing Form defeated Park Place at the International Polo Club Palm Beach. A dominating performance from Aspen had them seemingly in control throughout the game behind the seven-goal performance of Polito Pieres and an exceptional game from Tomas Schwencke who played above his 2-goal handicap with two goals and two assists. Unwilling to concede defeat, Mariano Obregon brought Santa Clara back into the game with his strong play, scoring all four of the five Santa Clara field goals. Aspen raced into the early lead as Polito Pieres took advantage of two early fouls to convert two Penalty 3’s. Pieres contributed to every Aspen goal in the opening half, setting up Lucas James and Schwencke for goals while continuing to score at a high rate himself. Santa Clara struggled to keep pace with Aspen’s fast team-based attack, shooting just 2 for 7 in the first half to trail by two goals. The possession continued to stay in favor of Aspen, with Pieres and James attacking relentlessly, while Schwencke claimed two assists in the fourth chukker, extending Aspen’s lead to four. Santa Clara was unable to complete consistent passes to gain the field advantage, relying on the play of Obregon to score from the field. A clean game allowed Aspen to maintain control in open play and keep a four-goal lead heading into the final chukker, but that changed in a final chukker that saw Aspen concede five fouls. Obregon was the key presence in Santa Clara’s comeback, causing four fouls and adding a field goal to help reduce the deficit. With four attempts from the penalty line, Ignacio Toccalino completed a perfect performance from the penalty line, shooting a perfect 6 for 6, including two clutch Penalty 4 conversions to send the game into overtime. 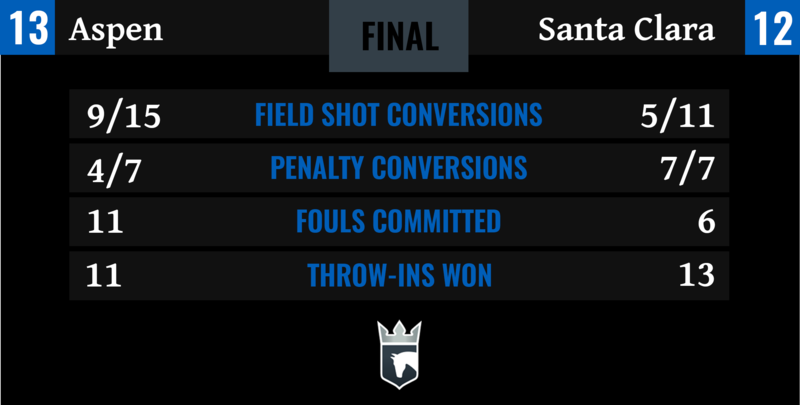 Shortly into overtime, Aspen drove down field and placed the Santa Clara defence into a tough position, resulting in a Penalty 2 that was converted by Pieres to overcome a tough Santa Clara team and claim their second victory of the tournament. The final game of the day featured another exciting conclusion with Daily Racing Form using a strong start to hang on for the narrow victory over Park Place. Quick passes allowed Daily Racing Form to generate offensive chances as all four players were effective at receiving and running with the ball. Nico Pieres kept Park Place in the game with accurate shooting from distance, but the slow start was ultimately Park Place’s demise in a close contest. Daily Racing Form dominated the throw-in line, winning the first eight throw-ins of the game to keep a consistent possession to claim a 3-1 lead, with three different scorers. Nico Pieres and Juan Britos worked well together on the attack to increase the offensive output from Park Place, but an organized Daily Racing Form defence slowed Lucas Diaz Alberdi and Andrey Borodin to keep their lead, finishing the half with an 8-5 advantage. A fast-paced start to the second half saw the two teams trade goals in a six-goal fourth chukker with Agustin Obregon accurate on the attack for Daily Racing Form. 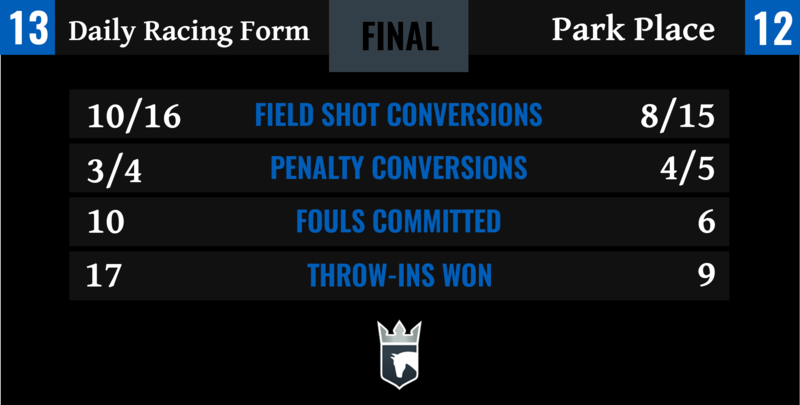 A disciplined Park Place team continued to gain momentum on their attack, placing Daily Racing Form into vulnerable positions resulting in three fouls and two penalty conversions for Pieres, bringing the score within two goals. Britos brought Park Place one goal closer to begin the sixth chukker, looking to claim their first lead of the game. Daily Racing Form’s Agustin Obregon responded with his fifth goal of the game to secure the victory and claim the narrow 13-12 goal victory.